The Brooklyn GOP did it again! David Storobin - your newest NY State Senator. This is huge. Not just for David Storobin, but for the Brooklyn GOP who have won two in a row in two special elections. Brooklyn now has 2 GOP State Senators and 2 GOP Congressman for the first time in history! This is the first time this has happened in New York City history. This is also the first time in Brooklyn and New York City history that an Assembly District has 2 GOP State Senator's and Congressmen representing it. (45th, 47th, and 48th AD's.). These three ADs are the only part of New York City to claim this - again, first time in history and Brooklyn is only one of 5 counties in the state of New York to claim this. Brooklyn has 5 GOP elected officials for the first time since 1974 when Brooklyn had 4 GOP Assemblyman (Vito Battista, Vincent Puccio, Dominick DiCarlo, and Bob Kelly), and State Senator Bill Conklin. A Republican represents parts of the 41st, 45th, 46th, 48th, 49th. and 59th AD - finally! Since taking over the leadership of the Kings County Republican Committee in the fall of 2007, when the Brooklyn GOP had only one elected official at any level of government - Senator Marty Golden, Craig Eaton has overseen a Republican revival in southern Brooklyn, including the elections of Assemblywoman Nicole Malliotakis, Congressman Michael Grimm, Congressman Bob Turner - and now State Senator David Storobin. “This was a team victory. We all have worked so hard, not only on this campaign, but for years leading up to this moment. Every decision we made laid the groundwork for this win – and the wins to come,” said Eaton. In 2009 and 2010, Craig Eaton put out the call to recruit new candidates to run for office at every level of government. As a result, many candidates emerged, along with many young energetic professionals who began to form a “bench” which would establish a foundation that the party could build upon. 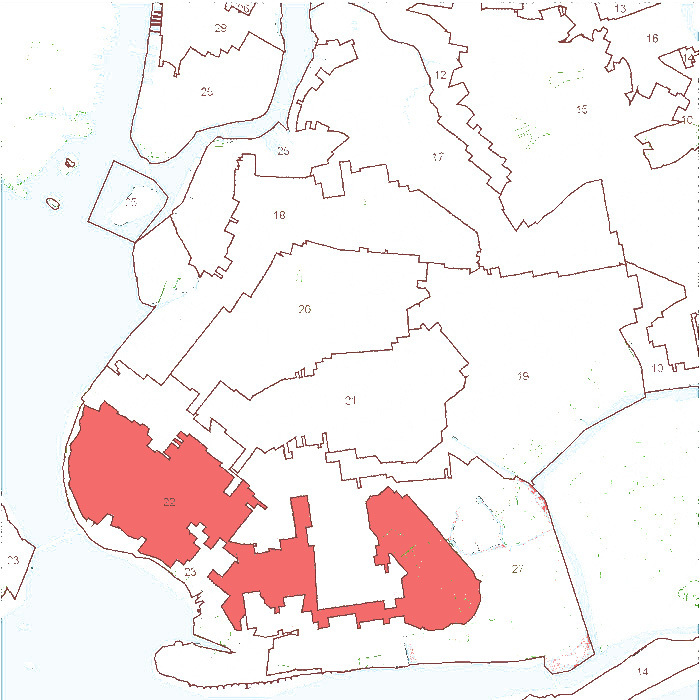 In 2010, the Brooklyn GOP saw the beginning of a shift in their favor based on the year’s election results: Brooklyn scored victories with inter-borough candidates Nicole Malliotakis for Assembly and Michael Grimm for Congress, and helped Senator Marty Golden get re-elected by a decisive margin. Brooklyn GOP candidates for Assembly tallied over 30% in the 45th, 47th, 48th, and 49th Assembly Districts for the first time in recent memory. In addition, statewide Republcan candidates for Attorney General (Dan Donovan) and Comptroller (Harry Wilson) carried those 4 Assembly Districts (along with Malliotakis’s 60th Assembly District). Congressional candidates in Brooklyn grabbed over 40% in the Brooklyn portions of the 8th and 9th Congressional districts – including a little-known businessman named Bob Turner, who nearly won in Brooklyn against then-Congressman Anthony Weiner. Brooklyn GOP Radio was also the catalyst in recruiting more young volunteers to the party, culminating with the re-launch of the Brooklyn Young Republicans in February of 2011. Under the leadership of its President, Russell Gallo, the Brooklyn YRs have called thousands of prime voters, knocked on thousands of doors, and are “2-for-2” in supporting candidates in special elections since their re-launch. 2011 would be a bellwether year for the Brooklyn GOP. After the “WeinerGate” scandal broke, Chairman Eaton convinced Bob Turner to run again for the seat, and set up a whirlwind tour of media appearances that ultimately resulted in his designation as the Republican candidate. Bob Turner shocked the nation, capturing a seat that a Republican had not held in over 80 years – and the Brooklyn GOP pushed him over the top. Over 100 volunteers from party ranks and enthusiastic young Republicans “pounded pavement” in Brooklyn and Queens, as Turner won by a resounding 2-to-1 margin in the Brooklyn section of the 9th Congressional District. After Congressman Turner’s district was “eviscerated” during the re-districting process, Chairman Craig Eaton started a near-impossible effort to get Congressman Turner on the ballot for U.S. Senate. Once again, the impossible became reality, as Eaton led a successful 72-hour charge that got Congressman Turner on the ballot – a real sign of Brooklyn’s emergence within the state GOP leadership. Look at how much of Brooklyn was represented by Republicans when Chairman Eaton took over leadership: 1 Senator. And baby, look at us now! Two Congressmen, Two Senators, and an Assemblywoman! Southern Brooklyn is RED!!! Congressman Bob Turner couldn't have said it better today. "Brooklyn and Republican is no longer a non sequitur." And the best part of all of this - we ain't done yet! russ and gene, amazing job!! you guys did the impossible. all of us are really proud of the work the two of you have done. onward and upward. lets make all of NYC my favorite color, red!